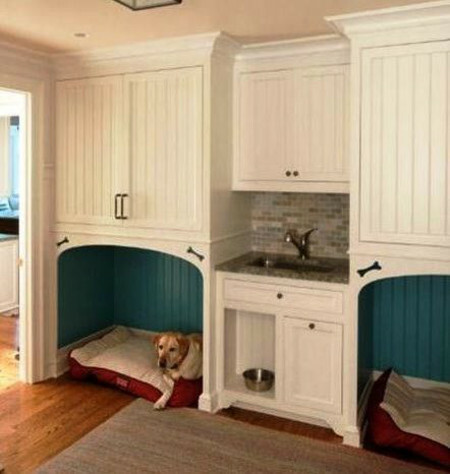 Ever more elaborate and clever, built in dog beds are common in home renovation planning. 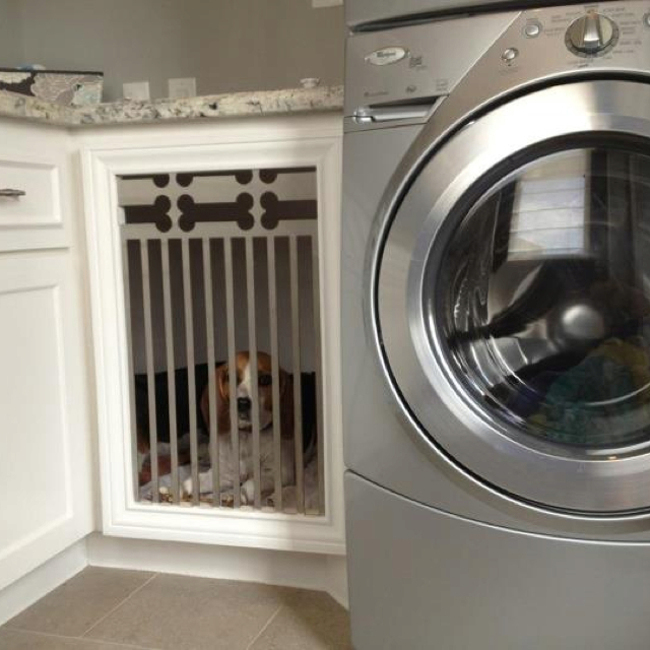 Just four years ago, Allison did a post called Built Ins for Pets with photos and ideas for built in dog beds, feeding stations and cute spaces for cats. Photos from that post has been pinned 434,000 times! Yes, you read that correctly. 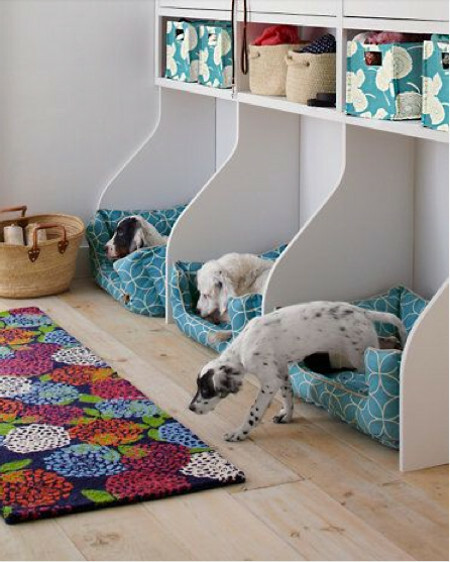 The sequel, Built Ins for Pets 2, offered even more ideas for creating attractive spaces especially for our cats and dogs and had more than 15,000 pins. So it’s time for more built in ideas — especially for dogs. A whimsical classical pediment above the wire mesh door is one of the most original details I’ve seen. To me, it says this crate is his castle. I’m speaking of the the beautiful guy with the glossy coat [top]. As you can see from the back door nearby, this dog bed was included in the mudroom/guestroom addition to a Massachusetts Tudor home. 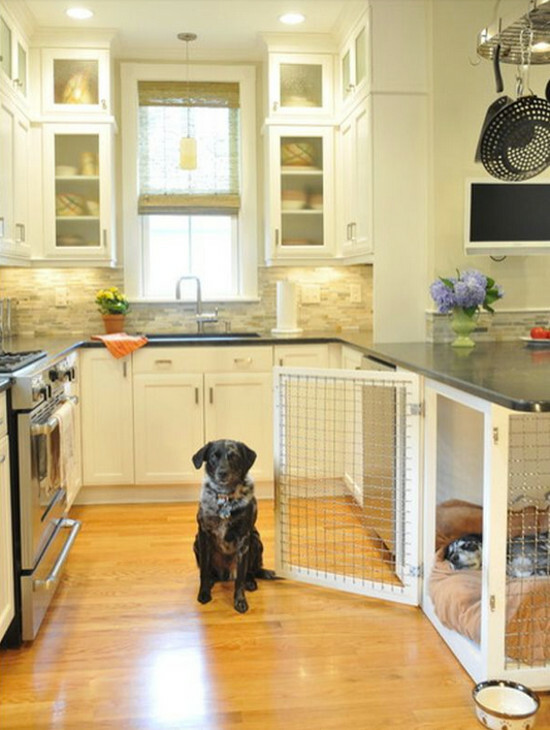 The crate has a removeable pad that helps make the tumbled marble tile floor comfortable, too. I could argue that a space right next to the washer in the laundry room might not be optimal given the machine’s noise and the dog’s hair. 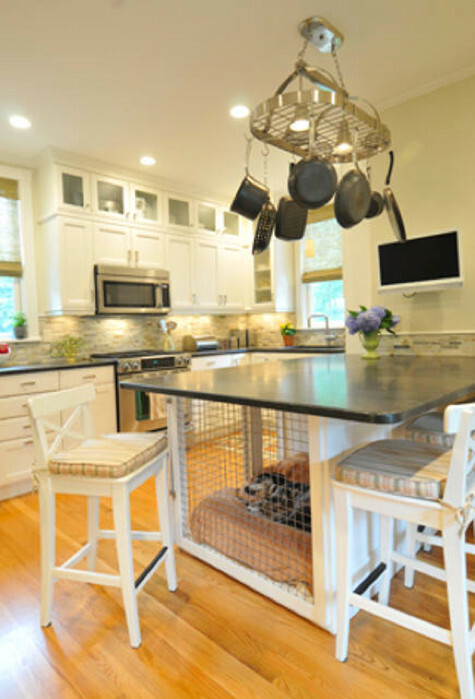 But the custom steel grate with dog-bone motif is so charming and sturdy and a corner cabinet often has a good deal of usable space. Without a visible handle the beefy door frame is a must. It’s not often to see a dog bed in a kitchen that’s nearly the size of a chicken coop! This one — set under the peninsula — houses two pups with ease. The mesh door opens into the galley side of the kitchen. But a different view of the peninsula (above) shows the side of the counter. And the bed is actually meshed in on two sides for maximum air and light. 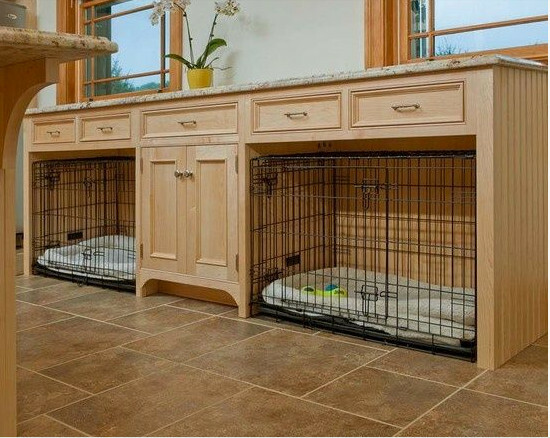 The counter overhang provides seating and the placement of this dog bed keeps pets in the center of the daily action. Suitcase style door crates can be ordered online. But they slide in perfectly to space created below a mudroom counter. With drawers above and a handy storage cabinet in between, this is a great solution for large dogs. And the crates slide out easily for cleaning, or transporting pets. 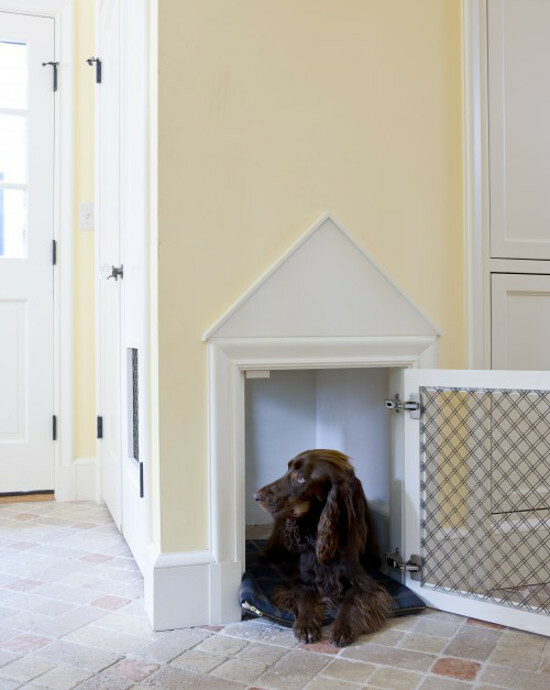 One section of a Connecticut mudroom was dedicated to the dogs and comes complete with custom beadboard alcoves. The contrast-painted teal interiors and the cut-out bone motifs on each side of the architectural arches say love louder than a Subaru. With cabinets, a sink and the feeding platform all built in, this certainly could be considered a streamlined, as well as luxurious, pup palazzo. This trio of built ins screams Ikea and I wish I knew the source because they are so simple and clever. Just like mudroom cubbies for kids, these house all the basics — cushioned beds below and toy boxes above. Plus a colorful rug! Anyone have any ideas, pics, for 3 pups, (schnauzers), for a three tier bed system? With wire so that I may kennel them if need be.